"Crisp and refreshing alternative to salsa. 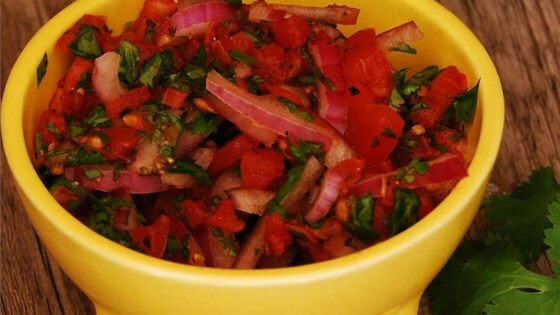 Marinated red onion, tomatoes and cilantro make up this traditional table condiment that is great on chicken tacos or with carne asada. Enjoy and make mi abuela proud!" Combine the onion, tomatoes, and cilantro in a non-metal bowl. Whisk together the vinegar, sugar, pepper and salt; pour over the onion mixture, and toss to coat. Cover and refrigerate 2 to 4 hours. Drain right before serving. This authentic salsa is bursting with fresh tomatoes, peppers, onions, and lime. I thought this was great and made it several times just like the recipes states, except that I did add garlic. Thanks for this great recipe!